Chef Andrea Lawson Gray is a longtime friend of ours in the SF Bay Area food world; she even participated in our very first 12 Nights of Chocolate. She’s also the founder of Private Chefs of the SF Bay, and she brings us this recipe via one of the chefs in the co-op, Rose Johnson. 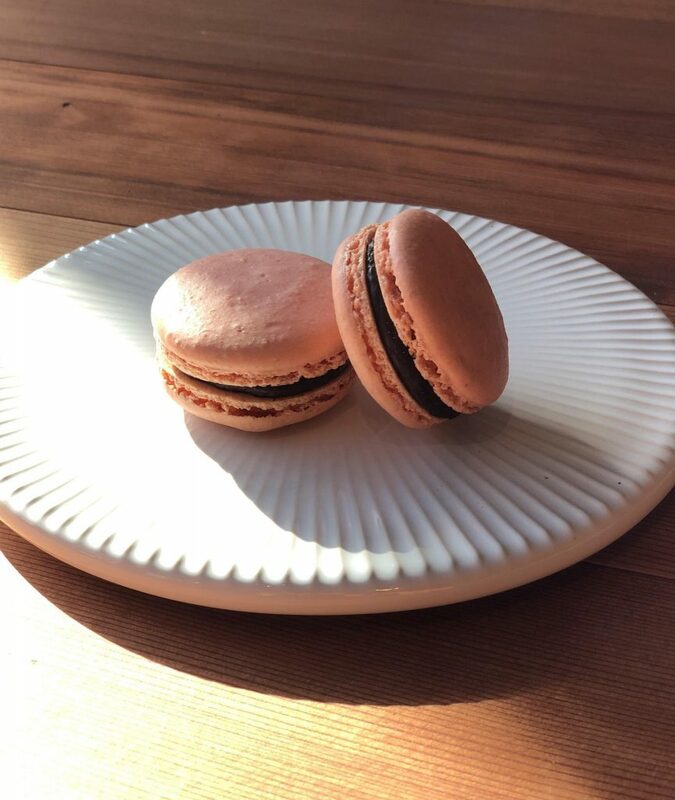 This chef collective does private catering and dinner parties, and they’ve been kind enough to make ours their chocolate of choice for all of their cooking and baking. 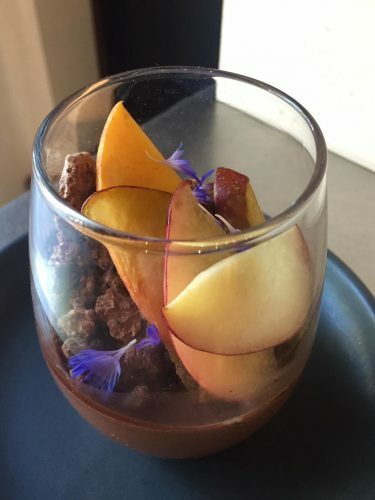 Karen S. tried this recipe with our Kokoa Kamili, Tanzania Chef’s Chocolate and thought that the tropical notes went really well with the tangy wine and labneh. Cut or snip the stems from the dried figs. Use a small paring knife or spoon handle to gently open the figs at the stem end and create a small pocket. 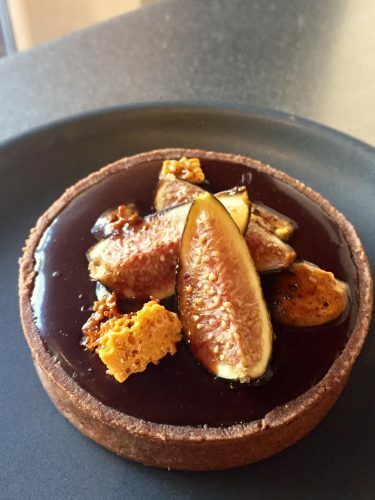 Stuff the fig with the chocolate, and top it with a toasted almond. Place the figs upright and snugly together in a heatproof ramekin, or make one from aluminum foil. Roast the figs until they soften and the chocolate melts, approximately 10-12 minutes. To make the crémeux, melt the chocolate in a bain marie or in the microwave (stirring at 20-second intervals) until melted. Fold the melted chocolate into the labne. Refrigerate until ready to serve. Now it’s time to make the sauce. In a small saucepan, combine the Port with the cream and reduce it over medium heat until it’s as thick and syrupy as honey. Pay attention, as it will thicken up fast! To assemble the dish, spoon some of the sauce onto a plate, then top with the figs. Place a dollop of the crémeux beside each fig, and serve. 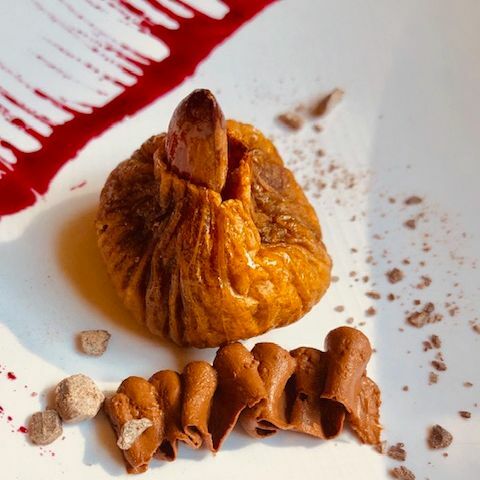 Be careful; the chocolate inside the fig may be very hot. I used to live and work in Kamiyama-cho on the island of Shikoku in Japan. I watched rice grow from every window of my tiny apartment. I taught English in four elementary schools and two middle schools, and in addition to leading an adult English conversation group with the inspiring farmers of my rural community, I also sang in the town choir. I learned a lot in Japan, including a love of taiko drumming, a deepened sense of obsession for Hello Kitty, and an appreciation for food that feels uniquely Japanese. It was at this point in my life that I fell in love with mochi in all forms. I still dream about a particular mochi stuffed with fresh strawberries and whipped cream that I once at in an Osaka train station. Lately, and here in the SF Bay Area, that mochi love continues. Hawaiian ono mochi rich with butter? Bring it. 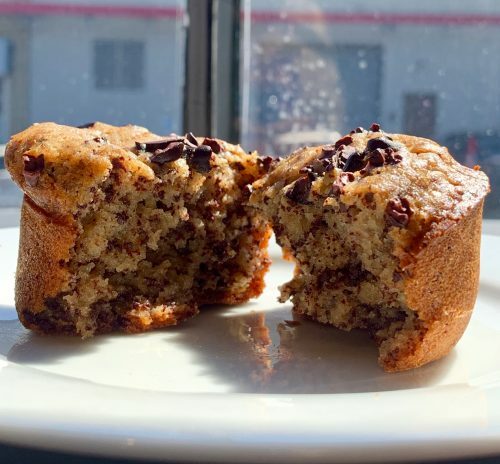 But the colorful, flavorful hybrid mochi muffins of Third Culture Bakery in Berkeley inspired me to incorporate our chef’s chocolate (also known as ground chocolate) and single-origin cocoa nibs into this decadent treat. 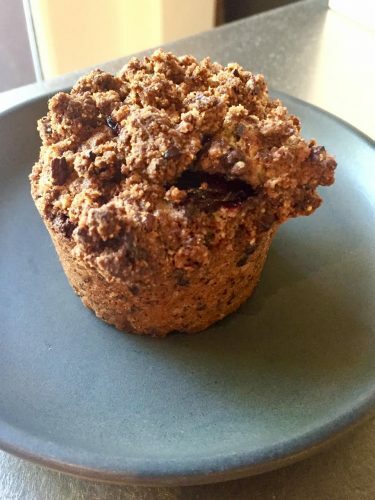 The texture is quite different than a regular muffin; dense, chewy, and rich. The flavor is chocolatey, nutty, and not too sweet, making them perfect for breakfast. Since it’s rice flour, these are also gluten-free. This recipe was adapted from Snixxy Kitchen. Preheat the oven to 350°F and center the oven rack. Grease the sides and the top of two 12-cup muffin tins with the coconut oil. In a medium mixing bowl, whisk together the sweet rice flour, dark brown sugar, baking powder, and salt. In a stand mixer or in a large mixing bowl, beat the eggs, then thoroughly blend in the coconut oil and the butter. Stream in the milk and the vanilla. Add a tablespoon or so of the dry ingredients to the wet ingredients and mix with a hand mixer until completely combined. In four batches, thoroughly combine the dry ingredients into the wet, making sure the ingredients are thoroughly combined. Stir the ground chocolate into the batter. Divide the batter among the prepared muffin cups, filling each cup almost all the way to the top. Sprinkle the tops of the muffins with the cocoa nibs, if using. Bake both tins together 40-50 minutes until the top is lightly brown and the muffin springs back when poked with a finger. Insert a toothpick into the thickest part of a muffin and make sure it comes out clean of raw batter. Let the muffins cool in the pan for 5 minutes, then transfer to a wire rack to cool completely. Enjoy immediately. Store the muffins in an airtight container, or wrap them well and freeze for at least three months. The 2018 Advent Calendar is Here! Michelle, who headed up this year’s Advent calendar odyssey, grew up in a German home where the holidays are huge, and Advent calendars are treasured handmade heirlooms. Just ask her and she will share her memories of the beloved daily dose of treats, toys, or coins to countdown to the holiday. And, of course, her and her sister’s giddy anticipation of trying to peek inside the pocket to see what tomorrow might bring. 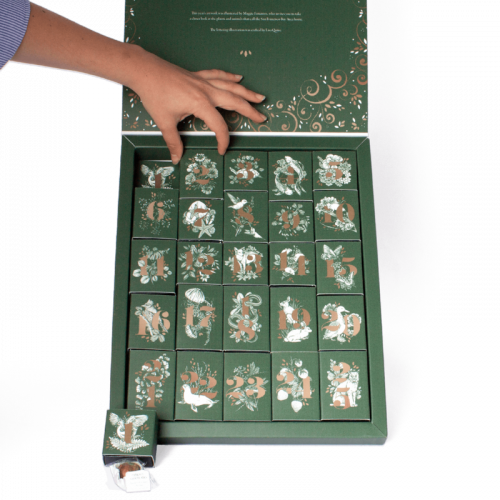 To make this project happen, we partnered with some of our favorite San Francisco Bay Area chocolatiers and treat makers to craft the Advent calendar of our childhood dreams. You have to understand that for these small mom-and-pop makers, creating an extra 800 or 1600 bonbons in the months before the holidays is a huge undertaking! We tip our hat to these small shops and thank them for squeezing us onto their busy production line. This year’s calendar is also a collaboration with artist Maggie Enterrios. We’ve been huge fans of Maggie’s playful, detailed nature illustrations for years, and we were so excited that we finally had the chance to work with her on this extra-large project. Her gorgeous hand drawings of local birds, bugs, and botany brought this year’s design to a whole new level. The detailed lettering and calligraphy are from another artist we admire very much: Lisa Quine. Every calendar in the collection is numbered by hand and comes tied in a shimmering forest green bow. We are so delighted to share this delicious display of edible beauty with you and whoever shares your holidays (and your chocolate). Each large calendar contains 25 hand-picked, treat-filled, reusable treasure boxes decorated with Maggie’s hand-drawn birds, animals, plants, or flowers that call the SF Bay Area home. The decadent confection inside each box is thoughtfully crafted by people who make the sweets we love. 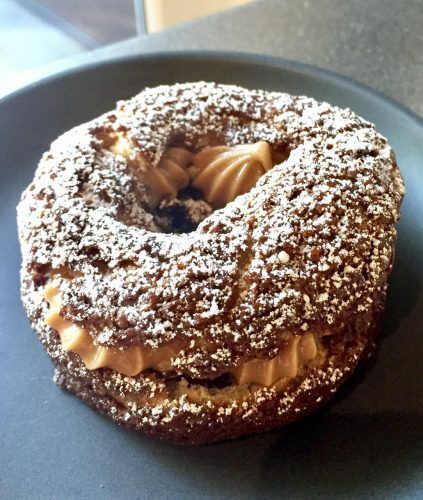 Crisp, smooth, or chewy; chocolatey, fruity, or nutty; the array of flavors and textures changes daily, though the quality and craftsmanship are in every bite. Each treat contains some element of our cocoa nibs or single-origin chocolate. To get you ready for what’s under the lid, know that some of the confection flavors include the Oolong Crisp Bar, Smokey the Bourbon, Gingersnap Praline, Speculoos Coffee Tile, Caramel Crunch, Mini Blood Orange Bonbons, and Burnt Honeycomb. You won’t want to miss out on this once-a-year celebration of art and chocolate! Get yours here. Supplies are limited and this is expected to sell out. Shipping is only available within the continental United States.